Botanical Name: Nelumbo nucifera. Organic certified with out chemicals (Wildcrafted from Himalayas). These seeds and pods are picked from the same single pond on the small farm in Nepal that the Blue Lotus petals and stamens are from. They have a rich blue hue, and are completely organic. These seeds have even been known to sprout years after they have been picked, but are most often used along with their pods to make seed tinctures. One of the most celebrated plants of human beings, lotus seeds have incredible potency. Three 2000–years–old lotus seeds were unearthed near Tokyo in 1951. Following year Dr. Ooga, a botanist, succeeded in germinating and blooming one of those seeds. All lotus seeds contain the anti–aging enzyme L–isoaspartyl methyltransferase, which is said to help repair damaged proteins, according to the Kushi Institute, a macrobiotic website. Because of this, many cosmetic companies are now finding ways to include the seeds in anti–aging blends. Daike Tian, in an article on the Water Gardeners International website, states that lotus seeds contain kaempferol, a natural flavonoid which prevents inflammation. Tian claims this this helps repair aging gum tissue. 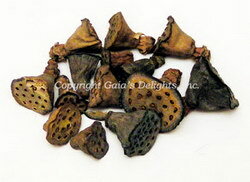 Dried lotus seeds must first be soaked in water overnight prior to use due to their hardness and toughness. They can then be germinated for growing them or in cooking added directly to soups and other dishes. When cooked in clear soups, lotus seeds are believed in Chinese medicine to "clear heat" and be particularly nutritious and restorative to one's health, which may explain the prevalence of their use in Chinese cuisine.